LuShu is a dream invasion game based on Inception, combining Chad Whattler's L.U.C.I.D. system and Daniel Bayne's WuShu Open. 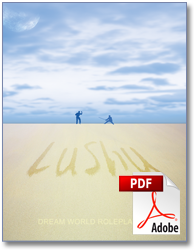 In LuShu, players take on the roles of a group of skilled con artists who invade people's dreams in order to steal (or leave behind) vital information. Inspired by the movie Inception and based on the L.U.C.I.D. game idea by Chad Wattler. LuShu expands combat and skills by incorporating Daniel Bayne's WuShu Open combat and character trait rules. LuShu is a rules-light game where players and GM work together to build the story. It is meant to be played with 5-7 people, and takes about 4 hours to play a session.